Get off the treadmill and put high-intensity interval training to work for you with these four fun approaches. Interval training burns fat, spares (or builds) muscle and takes a fraction of the time of traditional cardio. These things we know. But what you might not know, what you might never have had beaten into your brain, is the fact that you don’t have to feel confined to a treadmill. You don’t have to just do lower-body focused work. You can use weights. You can – wait for it – have a little fun. The jury may still be out on the best work-to-rest ratio when it comes to sprint interval training. But we do know that higher intensities typically require longer rest intervals. 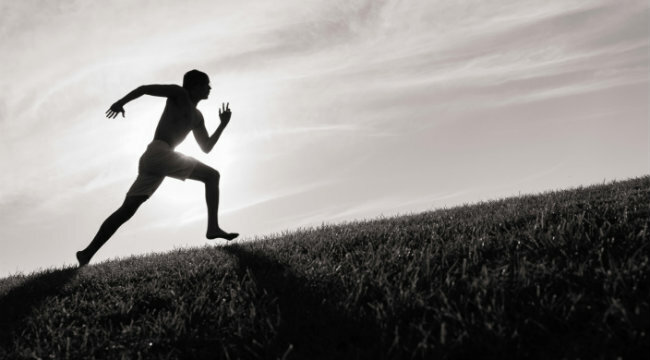 And when it comes to anaerobic training, the best ratio is typically between 1:5 and 1:10. This session calls for you to go all-out on six, 20-second sprints, followed by two minutes of rest for a 1:6 work-to-rest ratio. This will still feel like death but it amounts to 120 fat-shredding seconds of total sprint time. --Precede this workout with 5-10 minutes of general warm-up and dynamic activity to prime your body for the high demand of the sprints. Take 2-3 days between sessions. Kettlebells come in plenty of sizes and, if you train at home, you’re going to pay for those extra pounds of the larger bells. With a moderately weighted kettlebell – think 35-44 pounds – you can get in a very high volume of work that addresses your glutes, hamstrings, lower back and metabolic machinery with the use of a single move. The Russian kettlebell swing is the easiest move to learn for non-kettlebellers – it is essentially an explosive hinge that lies somewhere between a Romanian deadlift and a partial squat. There are plenty of nuances to learn but to get started, with your knees slightly bent, shift your glutes back and keep your back flat and arms straight, then explosively shift your hips forward while swinging the bell out to eye level. Let gravity return the bell between your legs and slightly behind you. Get into a rhythm and focus on an explosive concentric action on each rep.
Research shows that the use of heavy ropes, commercially known as battling ropes (www.powerropes.com) produces metabolic benefits similar to sprinting or biking, but with one distinct difference: it is an upper-body focused activity. The good news is that these primitive pieces of equipment are becoming available at more and more gyms. Two of the most common uses are alternating waves and two-handed slams, the latter being more of a “power” activity than the former. In both cases, your aim should be to send as many waves down the line as possible in the time allotted. Keep the ropes moving for the entire interval and you’ll develop a deep burn in your shoulders, arms, midsection, upper back and lungs. There may be nothing more cathartic than thundering away with impunity on a helpless heavy bag. But if you can discipline yourself enough to mix in some technique – throwing in various combos that include straight punches, hooks and uppercuts – you stand to get an even tougher workout. On the top end, you can burn around 500 calories in a 30-minute session. If you shift gears to an interval-style session, you may not burn as many during the session but you stand to burn plenty more after. Going hard for short flurries also mimics the pace of real-life boxers going toe-to-toe with opponents, looking for opportunities to strike. A light-to-moderate pace calls for you to simply “touch” the bag with punches from various angles. 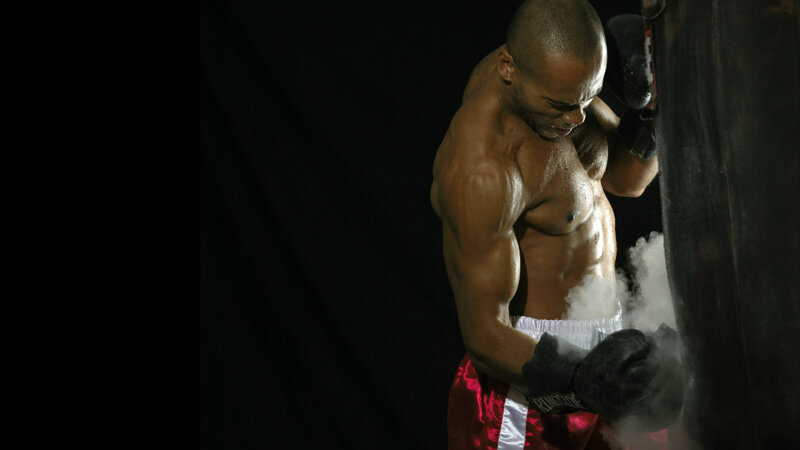 Heavy intervals call for you to come unhinged on the bag in 10-second bouts. Perform swing for 10 seconds. Rest for 20 seconds. Repeat five times. Track total reps and strive to perform more reps or use a heavier kettlebell each workout. Go for 20 seconds. Rest for 10 seconds. Repeat 2 exercise sequence 4 times. Light to moderate first 50 seconds. Heavy for next 10 seconds. Repeat for 5 total rounds.